Set aside, O Lord, the bond of sentence written for us by the law of sin, which in the Paschal Mystery you canceled through the Resurrection of Christ your Son. Who lives and reigns with you in the unity of the Holy Spirit, one God, for ever and ever. According to the 1962 Missal of St. John XXIII the Extraordinary Form of the Roman Rite, today is the feast of St. Justin, martyr and also the commemoration of Sts. Tiburtius, Valerian and Maximus, martyrs who died with St. Cecilia. St. Justin's feast in the Ordinary Form of the Roman Rite is celebrated on June 1. When the wedding day came, St. Cecilia sat apart from the guests, repeating psalms and praying. After the ceremony, when the guests had departed and she was alone with her husband, Valerian, Cecilia made known her great desire to remain as she was, saying that she already had a lover, an angel of God, who was very jealous. Valerian, shaken by suspicion, fear, and anger, said to her: "Show me this angel. 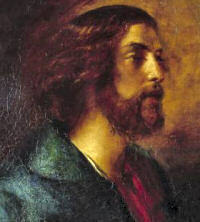 If he is of God, I shall refrain, as you wish, but if he is a human lover, you both must die." Cecilia answered: "If you believe in the one true and living God and receive the water of baptism, then you shall see the angel." Valerian assented, and following his wife's directions sought out a bishop named Urban, who was in hiding among the tombs of the martyrs, for this was a time of persecutions. Valerian made his profession of faith and the bishop baptized him. When the young husband returned, he found an angel with flaming wings standing beside Cecilia. The angel placed chaplets of roses and lilies on their heads. The brother of Valerian, Tiburtius, was also converted; and after being baptized he too experienced many marvels. Valerian and Tiburtius devoted themselves to good works on behalf of the Christian community, and they made it their special duty to give proper burial to those Christians who were put to death by order of the prefect Almachius. The two brothers were themselves soon sentenced for refusing to sacrifice to Jupiter. Maximus, a Roman officer charged with their execution, was converted by a vision that came to him in the hour of their death. After professing Christianity, he too suffered martyrdom. The three were buried by the grieving Cecilia, and a little later she herself was sentenced. Excerpted from Lives of Saints, Published by John J. Crawley & Co., Inc.
Saint Peter Gonzales was born in Spain in 1190, of parents both rich and noble. He was brought up by his maternal uncle, a bishop in the region of Astorga, and while still young was named a canon of his cathedral. Soon he was chosen to be head of the cathedral chapter; but when he came to take possession of that office, mounted on a finely arrayed horse, the animal by a false step threw him into the mud. And then he was surrounded not by honors, but by laughter and mocking words. 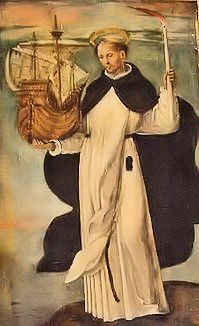 This for the young man was a special grace which enlightened him on the value of the world's dignities, and he decided to enter the Dominican Order at Palencia. Saint Peter worked toward his perfection with fervor, and while still a novice manifested great generosity, ready to offer his services whenever an occasion presented itself. He later studied theology to serve his neighbor in the spirit of his Order, and became so competent that he was sent to preach and hear confessions. In so doing he won many souls for Christ. Everywhere he exhorted to penance, exalting the state of grace and painting in fearful terms that of mortal sin, with such efficacy that he overcame the most hardened hearts. King Ferdinand III, desiring to put the Moors out of his kingdom, called the famous preacher to his court to benefit from his counsels and prayers. Saint Peter, fortified by the confidence of the prince, was able to revitalize the faith of the court and the army. But jealous ones set a trap for him; a courtesan was sent to him, apparently to make her confession, but in reality to try to seduce him. When he recognized her design, he went to an adjoining room and wrapping himself in his cloak, stood unharmed amid a great fire which he had lit there; then he called her to come. She and his false friends were converted at the sight of this prodigy, and thereafter all showed themselves filled with veneration for the priest. When the King won many military victories and took Cordova from the Moors in 1236, Saint Peter moderated the ill-directed energies of the conquerors and saw to the transformation of its great mosque into a cathedral. He left the court when it seemed his presence was less necessary, and continued his preaching elsewhere. God honored him with the gift of healing and miracles, and above all gave him the grace to make the truths of salvation understood by the poor and simple folk. He fell ill during Holy Week and died on the day of our Lord's Resurrection in 1248. Saint Peter saw to the building of a bridge over a river, at a place where many had perished. He is often depicted walking on the waters with a torch in hand. He has appeared to mariners in danger, and is invoked in particular by those in peril on the seas, always with happy results.